This roof is composed of aluminium and dull glass of safety. We have installed this aluminium roof in the town of San Miguel de Abona. 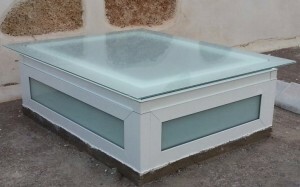 This skylight is composed of aluminum and dull glass safety. The skylight is installed in the roof of the house. If someone does not know it,skylights are light transmitting fenestration (elements filling building envelope openings) forming all, or a portion of, the roof of a building’s space for daylighting purposes. Aluminium Design manufacture aluminium structures as this exhibitor bookstand which you can see in the pictures. This lectern in aluminium for magazines and newspapers combines elegance and stability. We will provide you with a costing based on your needs and requirements.